One of the greatest things about being a vegan is exploring all the delicious food available to you. Increasingly, there are options available in restaurants, at corner shops, and at farmers’ markets. But what about those days when you’re on the run, or you’re out for a pint at a less than vegan-friendly pub and you find yourself with a roaring case of the hungries? Being a healthy, happy vegan, I am a high energy sort of person, the kind who has trouble sitting still for long periods of time. But as my partner and friends and family will attest, if I don’t get in enough foodies my energy and mood flatline and I turn into a non-reactive zombie woman (vegan zombie: “Graaaains, graaains!”). This, my friends, is where Purse Food comes in (Murse Food for those gentlemen who carry a man bag). It’s become a running gag amongst my friends that I have a constant stash of snacks hidden away in the folds of my roomy Mat and Nat bag, always ready to go for when I find myself peckish in a situation with few vegan options. A tidy stock of Purse Food is one of the greatest tools in a vegan ninja’s arsenal of tricks. Dried fruit and pre-wrapped vegan snacks (a.k.a. 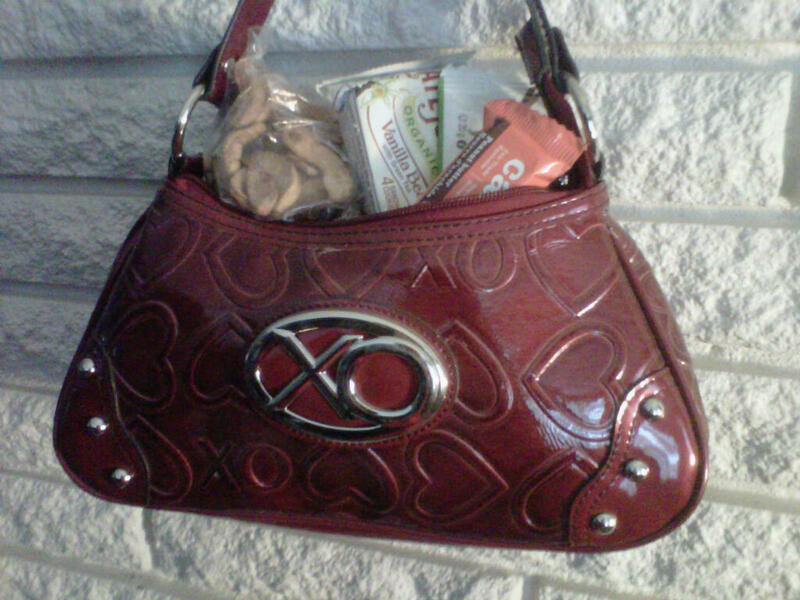 Purse or Murse Food) should always be kept nearby in case of a hunger emergency. This tiny purse is holding dried apples, Late July cookies, a PC Organics crispy brown rice bar, and a peanut butter Cocoa Camino snack bar. Don’t get me wrong: I’m not an advocate of going out with friends to places where the “vegan option” on the menu is an iceburg lettuce salad, and part the fun of strengthening your vegan values and lifestyle is choosing to support places that support us. And I am lucky to hang out with nice people who take into account my veganity and more often than not like to go to places where we can all find something good to eat. But it’s good to be armed for situations that are less than perfect, and being an easy-going, always-prepared person gets you far in the battle to show the world how relaxed and non-complicated being a vegan really is. Stocking your bag with a selection of goodies means you never have to worry about what to do when you feel your energy dropping in the middle of a busy day at work, when you’re stuck in a meeting, or when you’re out running errands. It also means you can choose to have healthy things stashed, so you don’t have to settle for processed crap from the 7-11 or stale, questionable baked goods at conferences and meetings. Cut up veggies and fresh fruit can work, too, though they’re better for times when you know you’ll be eating them within a few hours (finding annihilated fruit in the bottom of your bag days later = fail). Then head on home, divvy your finds into small containers or resealable bags, and venture forth confidently to rock your own vegan world. Next NCVA Potluck on March 18, 2018!